Dear neighbors, we are back home… and so sorry to have left Brittany. Back home means getting back to our daily humdrum, and in my case also back to my physical therapy sessions, which have been reduced to two a week, due to the great progress since July. It’s almost like going to a gym club, I get to see the same faces as some of the people there are « regulars ». I even met an old school friend of mine who has to deal with multiple sclerosis… No fun. I hope I never get to be a « regular ». Anyway, I can no longer delay the translation of my « Salidou » recipe, so here we go. « Salidou » (meaning salty and sweet), a specialty from Brittany, is a delicious spread traditionally made with sugar, cream and salted butter… all delicious but forbidden foods for my dear husband ! 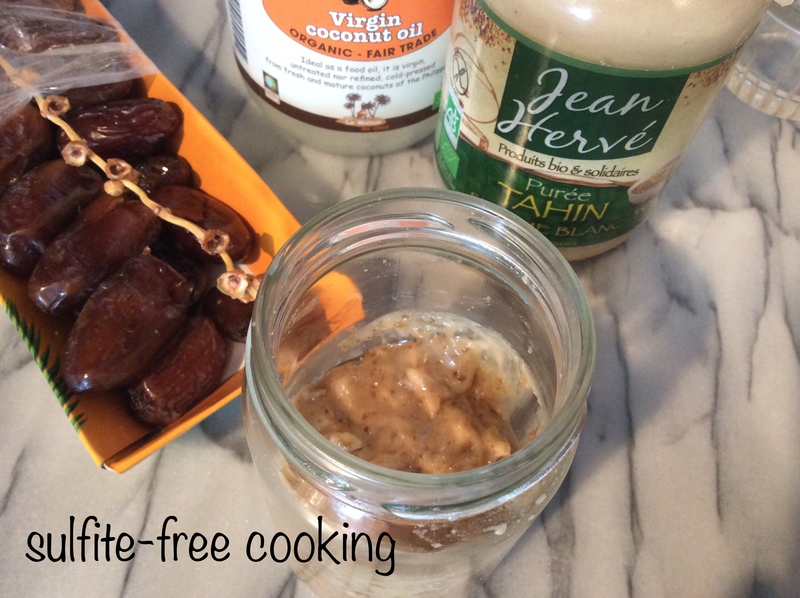 In my own version, there are dates for the caramel-like taste, tahini to complement their sweetness, a little water and finally coconut oil for the oh-so-smooth Salidou texture. This is not the first time that I have combined date and tahini; I have made energy balls using these two ingredients, as well as cashews, and GF oats. To stay in the Breton spirit, I have used this spread on homemade crêpes. Quite a treat, trust me ! Mix all ingredients with the help of an immersion blender. You can of course adjust the quantities to your own personal taste. More dates will mean more sweetness, more tahini more of a tang. Enjoy, dear neighbors!